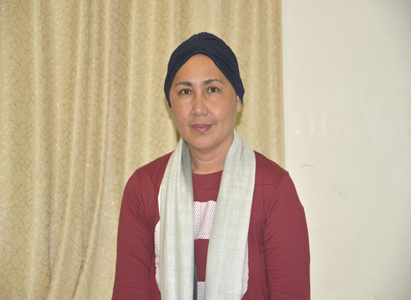 MIMIE ABUTIN, from the Philippines, enjoyed her simple, peaceful and happy life before 52 years old. With a good husband who loved her deeply, filial children, and lovely grandchildren, she was proud of her warm and happy family. Every day, she was busy in taking care of her elderly mother and young grandchildren, and doing all the daily chores. She was quite content with all of these. In February, 2015, MIMIE occasionally found a 2cm lump in her right breast and was diagnosed with breast cancer by the local doctor. On hearing this news, she was depressed, desperate and scared. After encouraged and soothed by her family, she became strong and accepted the fact bravely. The local doctor advised her to take mastectomy and chemotherapy. However, considering the pain of chemotherapy, MIMIE refused it. And then, the doctor recommended her Modern Cancer Hospital Guangzhou because of its minimally invasive therapy which has advantages of smaller trauma, less pain etc. Meanwhile, her neighbor who got the same cancer and had received treatment in Modern Cancer Hospital Guangzhou with good therapeutic effect also recommended her this hospital. So, she decided to take cancer treatment in China. 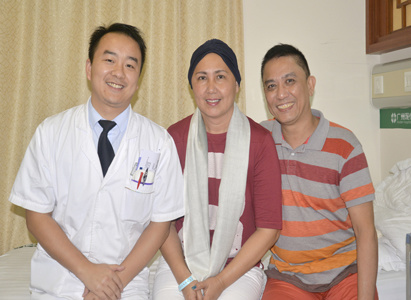 On March 17, 2015, MIMIE and her husband came to Modern Cancer Hospital Guangzhou for the first time. After a series of checks, MIMIE was told that the tumor had grown to 3cm. Professional MDT (Multidisciplinary Team) made a plan of natural therapy and interventional therapy. But, MIMIE felt worried and was afraid of treatment failure. With doctor’s detailed explanation and encouragement, MIMIE finally got the courage to take the treatment. After a session of natural therapy and two sessions of interventional therapies, the tumor shrank to 1.03cm quickly. Knowing that, MIMIE became confident about the next treatment. In the end of the interview, MIMIE and her husband shared their feelings of this anticancer experience. Her husband said that cancer happened unexpectedly. Although it greatly struck them, they did not give up. The most they got was family unity. All the families and friends got together to support and encourage MIMIE, which touched them the most. And he expressed that he would seize their second chance that was given by Modern Cancer Hospital Guangzhou to give MIMIE a better life. Additionally, MIMIE shared her wished that, she could go home immediately and live a simple and happy life with her beloved families as before. And we all gave her our best wishes.